As I typed in the address to the Comfort Suites hotel in St. Joseph, Michigan from Indianapolis, Indiana, the map looked like it was leading us directly into Lake Michigan. Knowing Siri would never steer me wrong, I followed the route and hoped to stay dry. Once she announced our arrival, we found ourselves in the town of St. Joseph, Michigan which literally sits on the shores of Lake Michigan. I assumed it would be a relaxed few days after our brief hospital visit in Indianapolis but had no idea what we would really find in this town. In the end, it was one of the best stops on our trip. 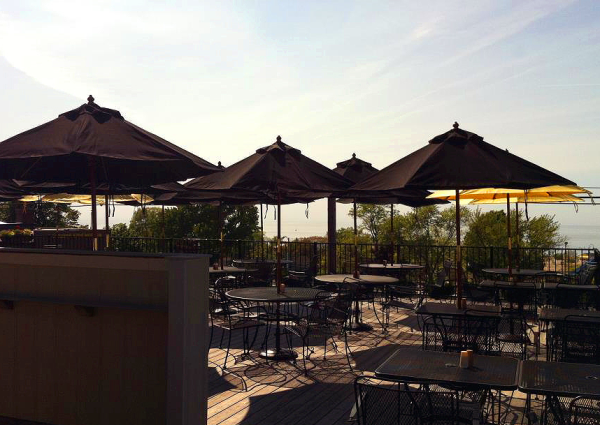 Here is where to stay, play and eat on the shores of Lake Michigan in St. Joseph, Michigan. We stayed at the Comfort Suites which is actually located in Stevensville, Michigan. Trust me, when I say it is the same thing as St. Joseph. The hotel was about an 8-minute drive to downtown St. Joseph which is literally 4 blocks wide. Besides impeccable service and hot cookies, there are a few more great reasons to stay at this hotel. 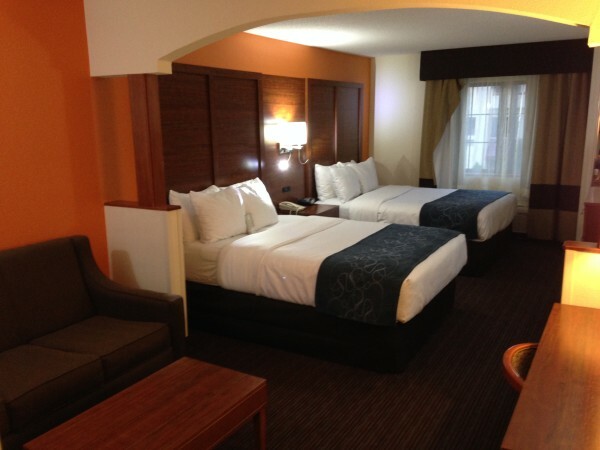 First off, the rooms are huge. We had two queen beds and a separate sitting space where I could work at night. Each night, we came home to a clean and tidy space where the kids could relax which I appreciated. 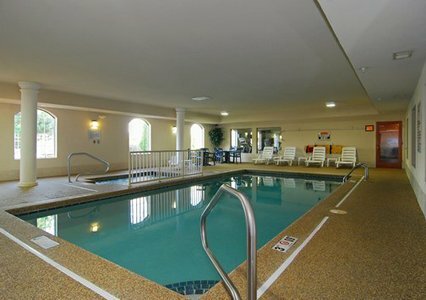 The hotel has an indoor pool which saved us on the one rainy night we had in St. Joseph. Even more important was that there was a large, easily accessible laundry room that was separate from the hotel rooms. With its separate location, the laundry room was open for use 24 hours a day which meant we could finally get all our laundry done. Families coming in from the beach were throwing wet towels and bathing suits in the dryer to get ready for the next morning. St. Joseph is also located in the Lake Michigan Shore Wine Country and the Comfort Suites had arrangements with various wineries for wine tours that would pick you up and drop you off at the hotel. I had to actually restrain myself from just jumping on the wine tour bus a few times but hope to return for a long weekend of wine soon. Rooms at the Comfort Suites run around $180US a night which makes this an incredibly affordable place to stay and visit St. Joseph. I would highly recommend checking them out. Let’s get this straight. St. Joseph is a small town with a lot of good food. From fresh fish to cafés, beach pizza and the world’s best ice cream, you will find it all here. Here are some of the places we loved. From downtown St. Joseph, all you have to do is look up to see the inviting umbrellas and packed patio at Rye Belles. I looked at the menu and headed on up the large staircase with the kids. I had been craving fresh fish and this was the place to find it. We ordered two fresh fish dishes to share and both were incredibly good. Add that to a family-friendly atmosphere and incredibly reasonable prices and Rye Belles is the place to eat dinner in St. Joseph, Michigan. 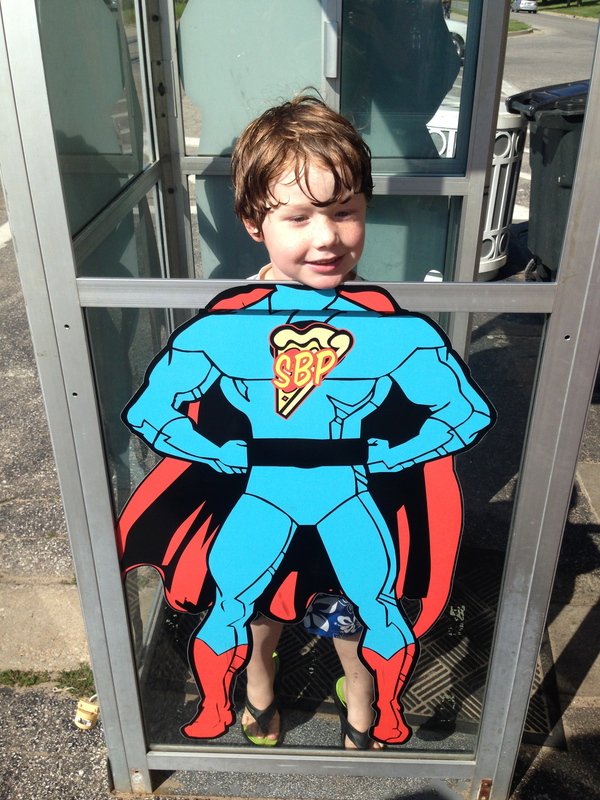 Located steps from the beach in St. Joseph, Silver Beach Pizza is a family tradition in this town. I watched as family after family, entered the restaurant to share pizzas, drinks and a lot of laughs. From the patio, you can see the large fountain and beach and its a great place to sit in enjoy the day. You can opt to use the take-out window and like a lot of people take the pizza to the beach. Otherwise, the restaurant is located right behind the take-out window and has dine-in options which I didn’t figure out right away. The pizza was great and this was a fun dining experience. 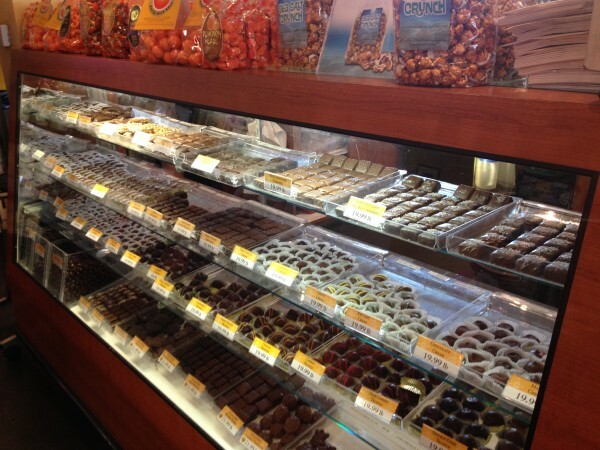 I am a chocolate loving girl with two ice cream loving kids and we don’t miss a Kilwins. Having found them mostly across Michigan and one in Lauderdale-By-The-Sea, Florida, I have become a dedicated connoisseur of their Michigan cherry ice cream and salted caramels. The kids were so excited to go in and Kilwins once again did not disappoint. This is real ice cream with friendly service and is a small town at its best. Speaking of chocolate, the most noticeable sign in all of St. Joseph is the giant Chocolate Café sign. Not only serving incredible chocolates from the South Bend Chocolate Company, but this café also serves huge pieces of cakes and freshly made sandwiches. We had a nice lunch followed by some delicious malted chocolate balls for dessert. Here is where St. Joseph gets even better. This is a family oriented town with lots of fun kids activities. These were my favorites. The jewel of St. Joseph is Silver Beach. A huge beach on Lake Michigan with a lot of family fun crammed in. 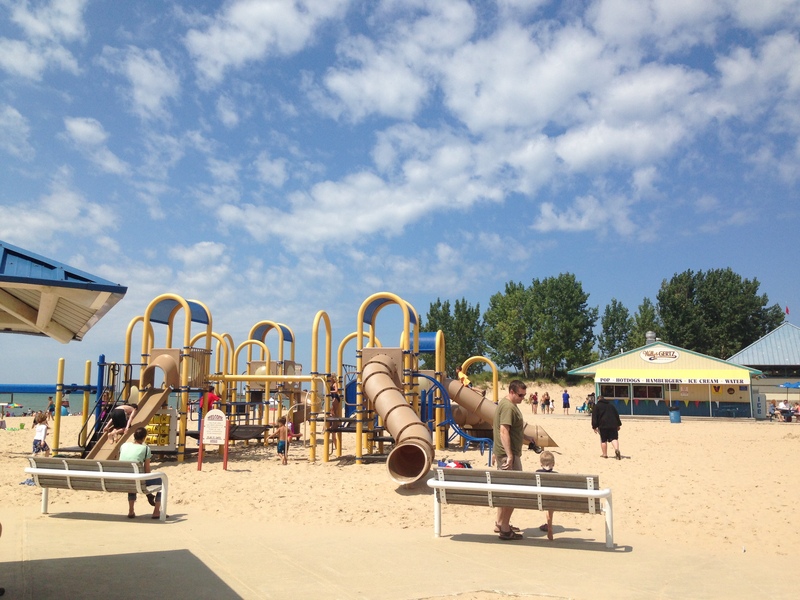 Besides swimming and lounging in the sand, there are large playground structures and volleyball nets for family fun. We spent a few hours just hanging out on the beach and playing at the park. Don’t miss the Whirlpool Compass Fountain which may be one of the most fun splash pads we found this summer. The kids loved playing in the fountains and running around. About every half hour the small fountains stop and large overhead fountains flood the area. I had to get in just to experience it and loved getting soaked with my two kids. Steps from Silver Beach is the Silver Beach Center. The first thing you’ll notice in the center is the gorgeous carousel. Kids and adults can ride to their heart’s content for $2 a ride. 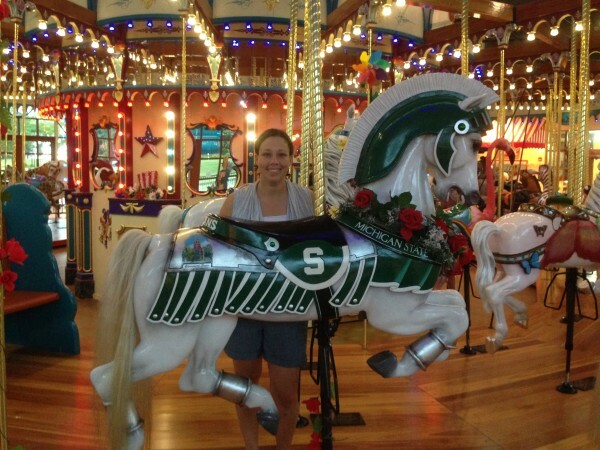 As a Michigan State Alumna, I obviously chose to ride the white horse bearing the Spartan “S” and dressed in roses to celebrate the 2014 Rose Bowl win. The Center also houses the Silver Beach Amusement Park Museum which was open from 1891-1971. Its an interesting look at the park and how declining visitors and expensive repairs caused its demise. My favorite part of the Center is the Curious Kids’ Discovery Zone. Part of the larger, Curious Kids’ Museum located a few minutes away, the Discovery Zone is the perfect size for a place for kids to play, learn and get out of the sun. We spent about an hour at the center and there was still a lot we didn’t get to see. 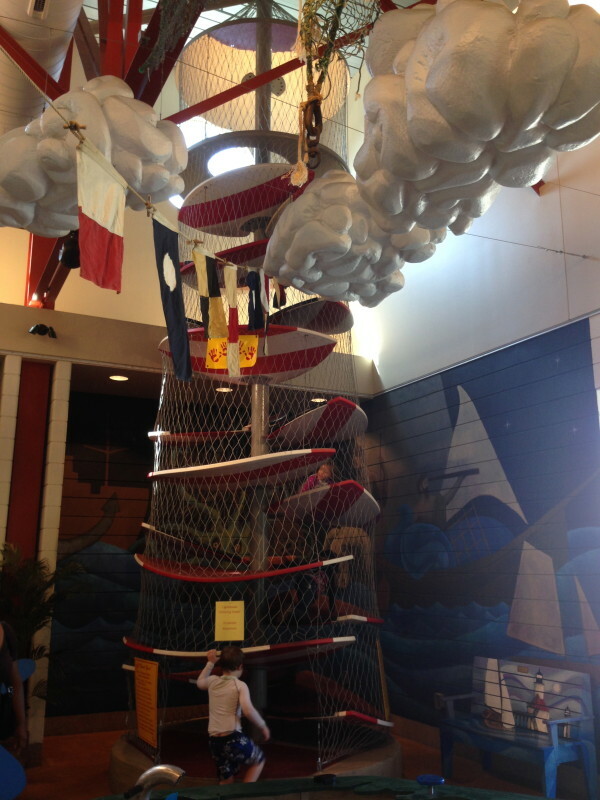 The kids loved the huge lighthouse climbing structure and the water play center was a hit. 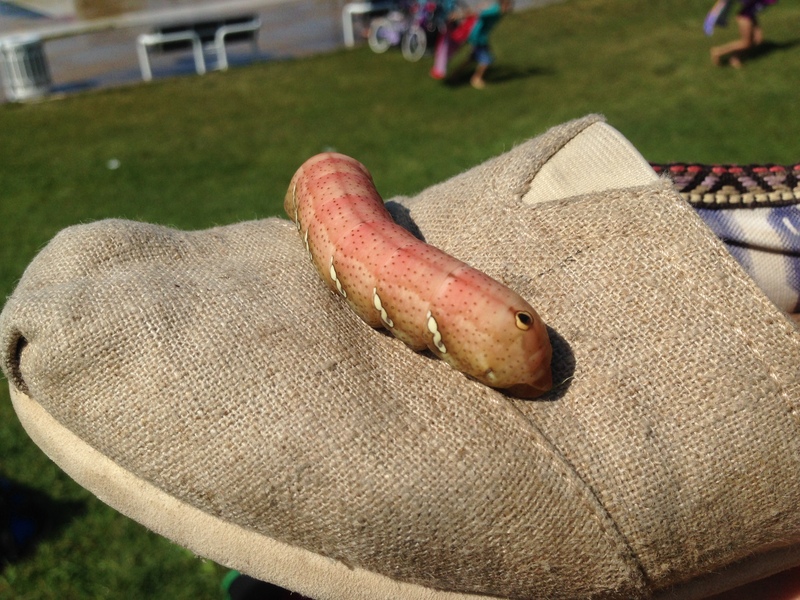 We found a disgusting large caterpillar which had somehow suctioned itself to my leg and the kids begged to bring it over to the Discovery Zone. The girls working took care of our not so tiny friend and promised to look more into what kind of bug he was. If you are interested in checking out St. Joseph yourself, you may want to schedule a visit during the Fall Festival taking place September 26th and 27th. The Fall Festival includes a Day on the Farm, featuring just-harvested fruits and vegetables and locally raised meats as well as a petting zoo and the Great Pumpkin Festival which includes pumpkin carving, games, and prizes. The Fall Festival wouldn’t be complete without a wine tasting in the park by the beach which features wine, local cuisine, live music and a public auction of art pieces. Participating wineries include local wineries Baroda Founders, Burgdorf’s Winery, Round Barn Winery and Michigan based craft cider makers Virtue Cider to name a few. 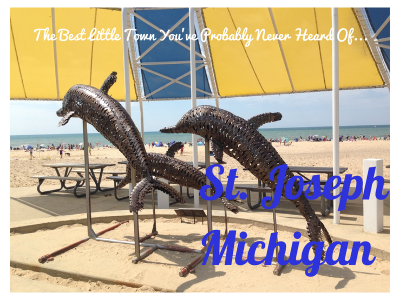 For more information on St. Joseph, Michigan check out www.stjoetoday.com. We LOVE St. Joseph! Silver Beach Pizza is our absolute FAVORITE pizza place and gotta love riding the carousel! We go at least once every summer! Loved this post! We just spent the weekend in St. Joseph with our two-year-old daughter. It made for a fun, low-key weekend getaway. She loved Silver Beach and we loved the Silver Harbor Brewing Company.